“A boat is big hole in the water, where you put money in.” Every boater is familiar with this saying, and… will fully agree with it. B.O.A.T. = Break Out Another Thousand. True as well. 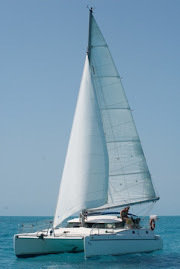 I can go on about this topic and come up with a few truths and statements as well, especially if it has to do with all the work and all the stuff that can go wrong, when you obtain a boat. I wont, though, since this is supposed to be a happy blog. 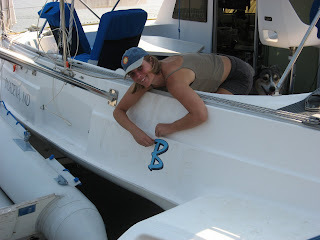 After living and working on the boat for a good three and a half months, we think we are finally ready to leave. We fixed all the problems, installed new electronics and gear, and made Irie a happy and clean girl. I think she forgave Mark for hitting her. He learned his lesson and suffered through wearing a cast for five weeks. 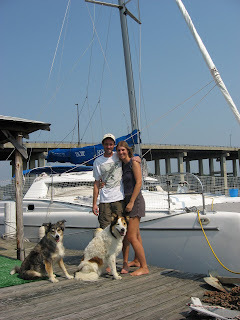 Tomorrow we will leave the marina in Edgewater, which was our home for over two months. The dogs loved it here, because of all the grass and beaches. It was a great place for them to cool off during those stifling humid summer months. 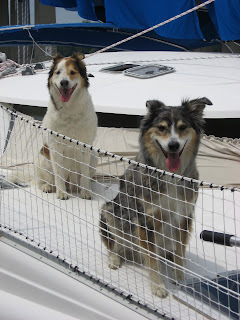 Next time we spend a summer in Annapolis, we’ll get an air conditioner, though! We also met a lot of interesting people, and fit right into the soap opera life taking place every day. Maybe I’ll write a book or a story about it, one day. Sometimes I think its wierd that Mark and I are friends because I love ignorance. Anyway, where is the section of the website that shows the odds and where we can place bets on when you sell the boat and just buy a big truck?